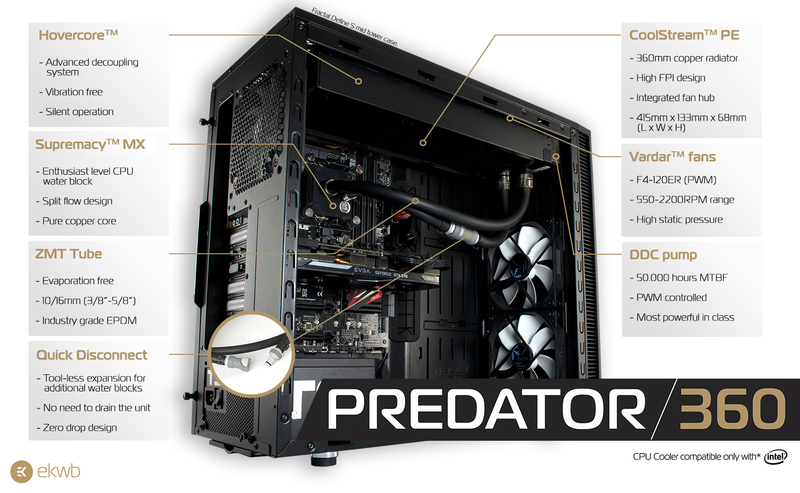 EK-XLC Predator 360 is next-generation, premium grade pre-filled and pre-assembled all-in-one (AIO) CPU liquid cooling unit. The unit provides extreme cooling performance and exceptional build quality unseen in the AIO (all-in-one) segment so far. 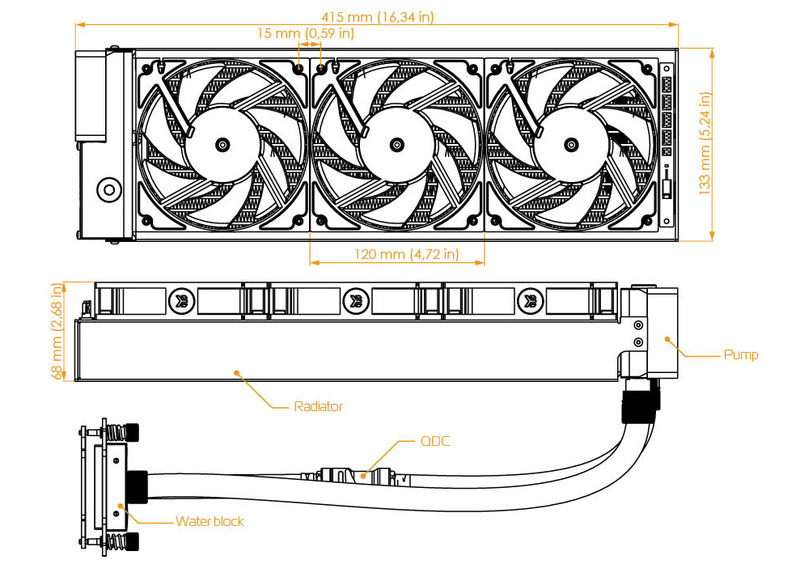 The unit utilizes top-tier EK-Vardar high-static pressure fans and market-proven Laing DDC liquid cooling pump. All-around PWM control provides minimal noise profile and performance on demand. Predator utilizes industry standard G1/4 threaded ports and 15,9/9,5mm (5/8" / 3/8") Zero Maintenance rubber tubing (EK-ZMT). It is fully expandable and customizable with all custom-loop liquid cooling gear available in our portfolio. Predator 360 features integrated Quick Disconnect Connector (QDC), a special no-spill connector that allows quick and tool-less expansion of the system without the need for draining of the unit. This allows users to effortlessly add a pre-filled QDC-enabled GPU water block. If you are more extreme user you can take the whole unit apart and rebuild it as you wish. Process of draining- and re-filling of the unit is easy and is thoroughly documented in the enclosed user guide. HovercoreTM is a new, revolutionary design of radiator de-couplering that effectively prevents transfer of pump induced vibrations from the unit to the computer chassis itself, thus resulting in vibration-free and silent operation. CoolStreamTM PE 360mm radiator, has a full copper core superior to aluminum alternatives in terms of heat dissipation. In conjunction with EK-Vardar fans the result is increased performance across an entire fan operational range, thus delivering results both at low- and high airflow operation. VardarTM fans – three on Predator 360 – are high-static pressure fans developed in-house specifically for liquid cooling systems. With low noise profile and PWM technology built in, the system always controls the RPM and keeps the fans silent while maintaining excellent cooling performance.